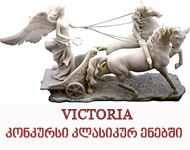 Within the framework of the Tbilisi Festival of Science and Innovations 2016, an academic symposium The Idea and Forms of Innovation in Greek Culture (Antiquity, the Middle Ages, Modernity) will be held on September 19 and 20 in the TSU Institute of Classical, Byzantine and Modern Greek Studies. Those interested in the Symposium should submit their contact details, and the title and abstract of their paper (max. 300 words) at greekstudies@tsu.ge before July 30, 2016. The Organizing Committee of the Symposium will communicate their decision before 6 August 2016. The Symposium organizers welcome papers from professors and researchers as well as students of all the three academic levels. Selected papers will be published in the symposium proceedings.